We have appropriately equipped and skilled roof cleaners who are going to use powerful jet washing machines to remove lichen, mould, algae, greasy stains and moss from rooftops. House roof cleaning is necessary if you want your home to look fine, and is also important simply because certain harmful growths can in fact “eat” and affect your roof if left neglected for long. Our service is fully insured and at a fantastic price! For assistance with cleaning your roof and gutters, bear in mind to book our general window cleaning service now! It's good to clean your gutters at least once every year, to avoid gutter and downpipes clogging and water damage to your property. Ashlee House Cleaning has vetted, skilled and experienced gutter cleaners who can efficiently clean out any dirt, leaves, twigs and other rubbish. They will ensure that you get your gutters clean with the help of telescopic pipes with cameras, connected to powerful dry or water vacuum cleaner. You will see photos of the condition of your downpipes and gutters. This service is offered with a 1 month quality guarantee, and we will come back to re-clean if they get clogged in the meantime. We have a really efficient system for service reservations. Our customer support staff is available 24/7 to process your demands. Just call 020 3746 1366 or send us an booking form. In the following 2 hours you will get an email affirmation for your booking. 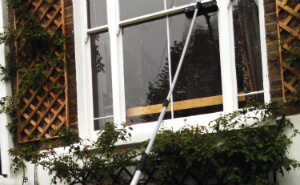 Our professional window cleaners will clean without any ladders and without stalking into your house windows if you are up to the Fourth floor. Our services come at good prices, with no concealed fees. Book more than One service and you will spend less both time and funds. There are special offers for those who book early, for our regular clientele, as well as for nearby property agencies and property admins. And so, if you want your windows thoroughly cleaned - schedule our window cleaning East Barnet N14 service at this moment!